Did you know that Oregon is home to varieties of truffles? Embrace the cool Oregon weather this winter and discover this amazing culinary treat waiting just beneath the soil. The Oregon Truffle is quickly becoming one of the most sought-after foods in the state – and the best time to discover them is right now! Between the months of December and February, Oregon Truffles are ripe for foraging through the Willamette Valley. The best way to locate the perfect truffle is with a trusty canine sidekick. Truffle hunting dogs have quickly become the mainstay of foragers looking for the ideal delicacy. Our Oregon Wine Country climate, it turns out, isn’t only perfectly suited for the growth of Pinot noir and other cool climate varietals, it’s also the epicenter of truffles outside of Europe. 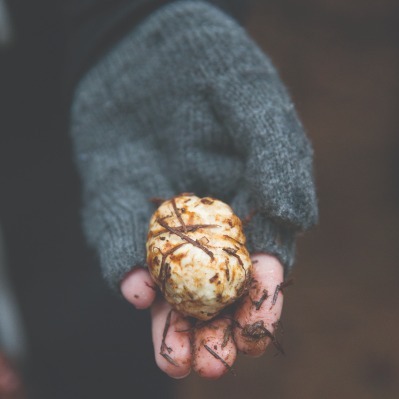 With the help of a knowledgeable guide and trusty truffle dog, wild black and white truffles can be foraged each fall and winter in the shaded ground of Willamette Valley Douglas firs. Food innovators here understand and embrace the truffle’s delicate seasonality; our chefs use them in dishes all throughout the winter season. We even have a festival where thousands of people from Oregon and beyond — both truffle connoisseurs and the truffle curious — attend each year to participate in dinners, tastings, demonstrations, workshops and foraging events. The 14th annual Oregon Truffle Festival takes place over two weekends: January 25-27 in Eugene, and February 15-17, 2019 in Yamhill Valley. Dozens of events during these weekends celebrate all of what the mysterious and elusive truffle has to offer like truffle hunts paired with winery luncheons, a truffle dog championship and the exclusive Grand Truffle Dinner to cap it all off. Learn more about Oregon truffles during truffle season and the 14th Annual Truffle Festival.